Propranolol is a type of medicine called a beta-blocker. Propranolol is a prescription drug which is used to prevent migraines, although it is not fully understood how Propranolol works in this area. Beta Blockers work by blocking Beta Receptors which are found in the heart. When they are blocked by Propranolol the heart is made to beat more slowly and with less force. This reduces the pressure at which the blood is pumped out of the heart and around the body to the brain, where the blood vessels contract and prevent the Migraine starting. One of the best ways of preventing migraines is recognising the things that trigger an attack. Some people who experience migraines begin to feel unwell a day or so before a migraine attack, these strange sensations are called the prodrome. We are able to prescribe Propranolol medication, which is known to prevent migraine attacks. suffer from blood circulation problems (which may cause your fingers and toes to tingle or turn pale or blue). Where can I buy Propranolol online? You can buy Propranolol online with or without a prescription at Medical Specialists, after completing a simple online consultation. Just complete an doctor consultation by clicking the orange button above. We are the UK’s leading supplier of pain killer medication, and Propranolol for sale in the UK. For full patient information, please read or print out the leaflet provided at the bottom of this page about Propranolol. Like all medicines, Propranolol tablets can have Side Effects, although not everybody gets them. Can you take Propranolol with other medicines? Propranolol tablets are not recommended during pregnancy or breastfeeding. Ask your doctor or pharmacist for advice before taking any medicine. 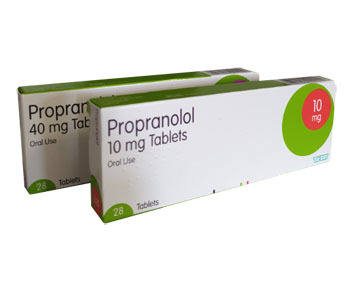 Propranolol tablets may cause visual disturbances, hallucinations, fatigue, mental confusion, dizziness or tiredness. Make sure you are not affected before you drive or operate machinery. If you have been told that you have an intolerance to some sugars, contact your doctor before taking this medicine, as it contains lactose. You are advised to avoid alcohol whilst taking this medicine. If you are going to have an anaesthetic or any blood or urine tests, please tell your doctor or dentist that you are taking Propranolol tablets. If you see another doctor or go into hospital, let them know what medicines you are taking.